﻿ Best Price on Hauts de Caritan in Sainte-Anne + Reviews! Surrounded by tropical gardens, the well-equipped Hauts de Caritan studio offers sea views and direct access to Caritan Beach just 150 metres away. 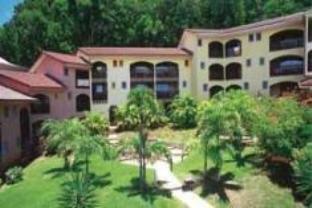 The bright Les Hauts de Caritan studio has a furnished balcony with views over Sainte-Anne Bay. It features a double bed, a flat-screen TV and air conditioning. You can prepare meals in the functional kitchenette, which includes a ceramic hob, coffee maker, microwave and fridge-freezer. Kitchenware, bed linen and towels are provided. Les Hauts de Caritan is at 850 meters from Sainte-Anne village, where you can find a market, shops and local restaurants. Salines Beach is 5 km away, while Aimé Césaire International Airport is 40 km away. To confirm your reservation, you will have to make a prepayment equivalent to 30% of the amount of your stay within 7 days. The balance must be paid 15 days before the keys are handed over. These payments can be made by credit card, via the secure PayPal service (no extra charge) or by bank check for customers residing on French territory. You can contact the property directly. Contact details on your booking confirmation. A cot with mosquito net is available for children under 2 years. A security deposit of EUR 300 is required upon arrival for incidentals. This deposit is fully refundable upon check-out and subject to a damage inspection of the accommodation.